The city of Seattle has long benefited from the fresh ocean breezes that flow in from Puget Sound. Now, a different kind of breeze is sweeping through the state of Washington’s largest city. It’s the air of political change represented in economist Kshama Sawant’s new position as the first elected socialist to the Seattle City Council. 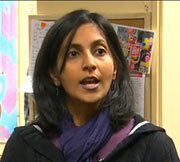 Sawant (pictured at left), a member of AFT Local 1789, is a part-time economics instructor at Seattle Central Community College. In a dramatic upset, the independent candidate garnered some 93,000 votes last November to defeat long-time Democratic councilman Richard Conlin.